Watching movies is my favorite hobby. I developed this habit when I was only seven years old. It was my uncle’s wedding. Weddings are the perfect and ideal time when all cousins and friends can do movie nights with absolute parents permission. Ever since whenever I have free time, I spend it watching movies. Most of my favorite movies are based on history, action and the lives of superheroes. Recently, I watched Black Panther and what a movie it was. 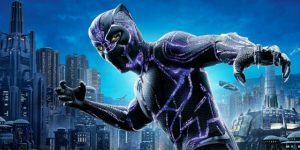 The Black Panther is a marvel movie adopted from the animated fictional African kingdom of Wakanda. The director of the film is Ryan Coogler. The movie starts with a bunch of kids playing in the basket ball court. Whereas, in the tall apartment building opposite to them, two black radicals are plotting a robbery. There’s a knock on the door and one of the men looks through the peephole. “Two Grace Jones looking Chicks with spears” is the dialogue that made me think what could be on the other side of the door. The other guy says to open the door or they won’t knock again. It is the King of Wakanda with his two guards. The hero of this tale is, of course, T’Challa (Chadwick Boseman, the king of Wakanda and the Black Panther, the protector of his people. To be the king, he had to drink the nectar of a mystical flower which gave him the strength of many as well as the king suit woven of bulletproof Vibranium which made him virtually indestructible. Wakanda is a country with unlimited resources of a precious and the strongest metal on Earth called Vibranium. Technologically advanced beyond the dreams of any other nation, Wakanda hides its advancement for centuries. To the rest of the world, it is a third world country. 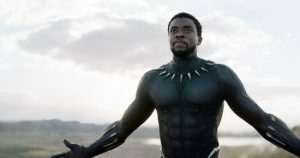 The movie shows the advanced African civilization, thriving in isolation, untouched by war or colonization which is the first ever vision of the world portrayed by the director Coogler. 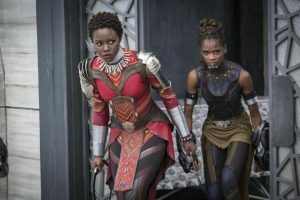 Some of the characters in the movie include; T’Challa younger sister, Shuri (Letitia Wright), a tech genius who develops super advanced stuff; his regal mother, Ramonda (Angela Bassett); the kingdom’s high priest, Zuri (Forest Whitaker); the surly chief of a rebellious clan, M’Baku (Winston Duke); T’Challa’s best friend and chief of the border guard, W’Kabi (Daniel Kaluuya); his chief general and head of the Dora Milaje, an all-female royal honor guard, Okoye (Danai Gurira); and his crush as well as ex, Nakia (Lupita Nyong’o), who is also a covert agent for the Dora Milaje. When T’Challa rescues Nakia from the traffickers; her reaction was “what are you doing here? You have ruined my mission! !” well, because she is working undercover to bust human traffickers operating in Nigeria. Being in the neighboring countries which are respectively backward led her to question Wakanda policy of secrecy. Her perspective is to use the wealth and knowledge to shape the world, in particular in Africa. 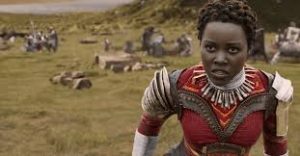 She stresses to quote “Wakanda is strong enough to help others and protect itself”. As we see in reality, most African nations are suffering from the diseases, conflict, civil wars, refugees, and poverty. But this rare movie offers another vision where the African nation has the capacity to offer to the African continent and beyond. 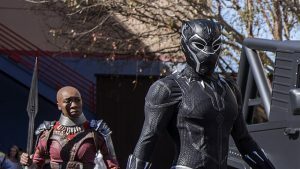 The secrecy that they have been keeping for centuries is not possible anymore because a piece of Vibranium is taken by an outsider who tried to sell it on the black market. 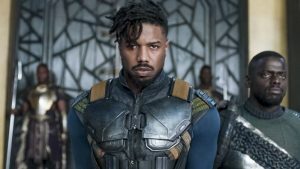 But this isn’t the only turn, the next is a mysterious American Black ops soldier trained in assassination and regime destabilization, Killmonger played by Michael B. Jordan. Killmonger has another vision for Wakanda, to quote his dialogues “the world’s going to change, and this time we will be on top”. Killmonger declares “the sun will never set on the Wakanda Empire!” he is the counterpart of superhero, a Marvel supervillain. The interesting fact is that Black Panther brought together one of the most impressive black casts together in the Hollywood movie. There are only two significant white characters Klaue and Martin Freeman who played the role of CIA agent Everett K. Ross. 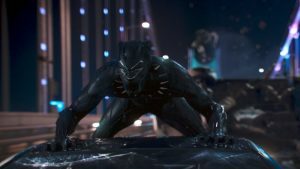 In the movie, T’Challa task is to become a better ruler than his father and change the direction of Wakanda. For long country had chosen secrecy of the high tech, isolationism was their ideology. The borders were firmly closed to foreigners. But he recognized the need to alter the ancient traditions. My favorite scene in the movie is when Killmonger challenges the king. He is a cousin of T’Challa. He accuses the late king of his father’s murder and now wants to take revenge. Killmonger trains himself for all his life to take back his status for which he plans eventually to be able to enter Wakanda. Killmonger straight challengees T’Challa to a fight to the death which is an ancient tradition in Wakanda which the King accepts. Before the fight, the power of Black Panther is taken back for the sake of fair fight among the two rivals. Killmonger wins the fight and throws T’Challa from the clip of mountain – giving a mini heart attack to the viewers. The story doesn’t end here. To find the actual twist you will have to watch the movie. It is a must watch movie and if youa re a tech lover you would definitely enjoy the high technology shown in the movie. 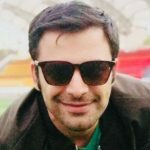 Action Against Judicial Officer Without Show-Cause, Is It Legal?